It is quite possible that the Subaru WRX and WRX STI you can currently buy new is a sedan. Sure, it's nice to see Subaru's go-fast cars holding it down for a dying segment, but a lot of us-included the practicality of the old WRX wagon and hatchback. 2019 Tokyo Auto Salon concept, though. Today we learn that at Japan's classier version of SEMA next month, Subaru wants to showcase two concepts: the Impreza STI Concept and Forester STI Concept , The latter's a hybrid STI, too. The Impreza STI Concept is clearly based on the non-WRX five-door hatchback we do get in America, but it's been outfitted with some custom wheels, aero bits and other parts. Notice the varnish of a hood scoop, however. If this thing has a turbocharged boxer engine under that hood, I'd be very surprised. Does not it look good, though? A WRX or STI hatch could meet all your needs, blasting through ice and rain with it's all-wheel drive and carrying all sorts of crap in the back? It's a great idea, but I'm not holding it in my breath. " 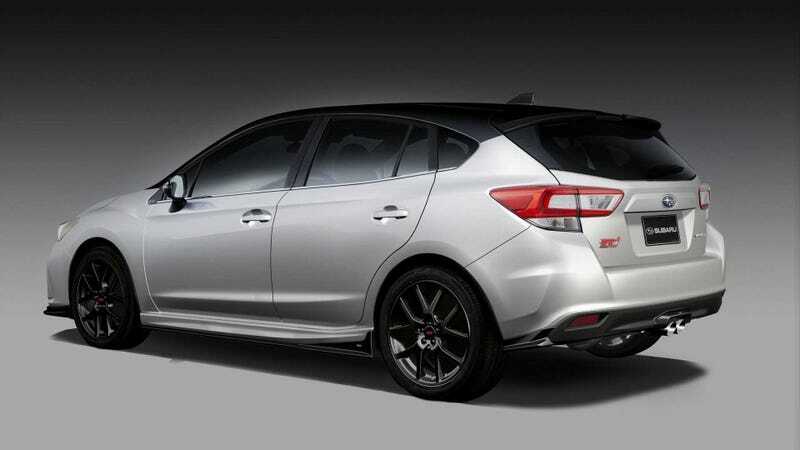 Then we have the Forester STI Concept. Forester eBoxer Hybrid, which has a combined output of about 155 horsepower and 187 lb-ft of torque-not bad but not STI-worthy, either. Here it gets more aero parts, a custom gray paint job, 19-inch wheels and Brembo six-piston caliber brakes up front. It looks sharp enough, but I have the power to turn back the flashy pink badges. Subaru at the Salon next month, or at the Detroit Auto show around the same time.